I stand at my desk. I have a laptop off to my side at about waist high and a second monitor in front of me. Whenever I do some sort of video chat I use the camera built in to the laptop. Consequently the people I’m chatting with see the side of my head and the ceiling. For some reason this makes people uneasy. That’s why Pee Wee Heman had those backdrops for his Picture-Phone. 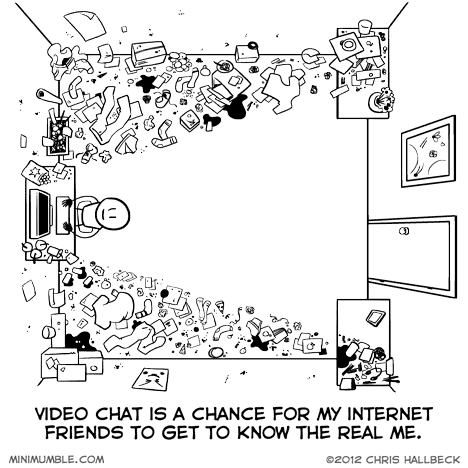 In the years to come that oddly selective field of tidiness will come to be known as The Skype Zone.